Home Old The Samsung Galaxy S II Gets Rooted……Already? 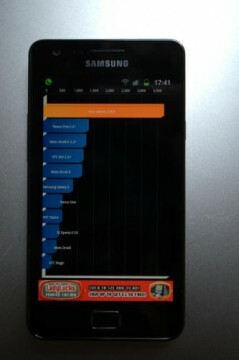 The Samsung Galaxy S II Gets Rooted……Already? Of course and as expected, the hard at work hacking community of XDA is at it again. This time, they’ve wasted no time cracking the Samsung Galaxy S II, Samsung’s latest flagship powerhouse to hit the smartphone market. On paper, this bad boy has it all. It sports a 4.3-inch Super AMOLED display, a dual-core 1GHz CPU, 8MP camera with HD video recording and Android version 2.3 Gingerbread, all packed in a super slim form factor. Only the good Lord himself knows what this phone will truly be capable of when XDA finally gets to tinker with it. Thanks to our friends over at AC, a tipster sent in a screenshot of a benchmark test from the device and it’s remarkably through the roof. Extremely impressive stuff! And from what we’re hearing, it’s not at all difficult to root the device. Thanks to XDA member Chainfire, it’s as easy as 1..2..3. So, head on over via the source link if you’re one of the lucky few who have the device and are interested in pushing it to the limit. Don’t forget to share with us what kind of performance and enhancements you’re seeing on the handset.